Mix fresh blueberries and peaches together with vanilla pudding in our Quick Peach-Blueberry Crisp. 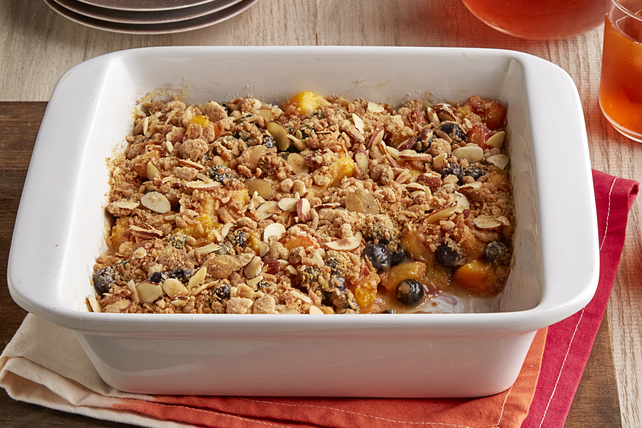 This peach-blueberry crisp is as tasty as it sounds. Combine flour and sugar in medium bowl. Add coconut, nuts and butter; mix well. Spoon into 9-inch square microwaveable dish. Microwave on HIGH 3 to 6 min. or until streusel is crisp and golden brown, stirring after each minute. Spread onto large plate; cool. Meanwhile, combine fruit and dry pudding in same microwaveable 9-inch square dish. Drizzle with water. Microwave 4 to 5 min. or until fruit is tender, stirring every 2 min. Cool slightly. Sprinkle streusel over fruit mixture before serving. Substitute chopped fresh plums for the peaches.